On May 18, 2018, Ana's Kitchen hosted the Simsbury Chamber’s Art Trail Champagne Breakfast to celebrate the kick off of the Art Trail which features thirty-two lifelike sculptures created by Seward Johnson. The exhibit can be found along Simsbury streets and gardens and is sponsored by the Simsbury Chamber of Commerce. Watch Ana's interview with the Hartford Courant. "Simsbury's iconic coffee shop is under new management. 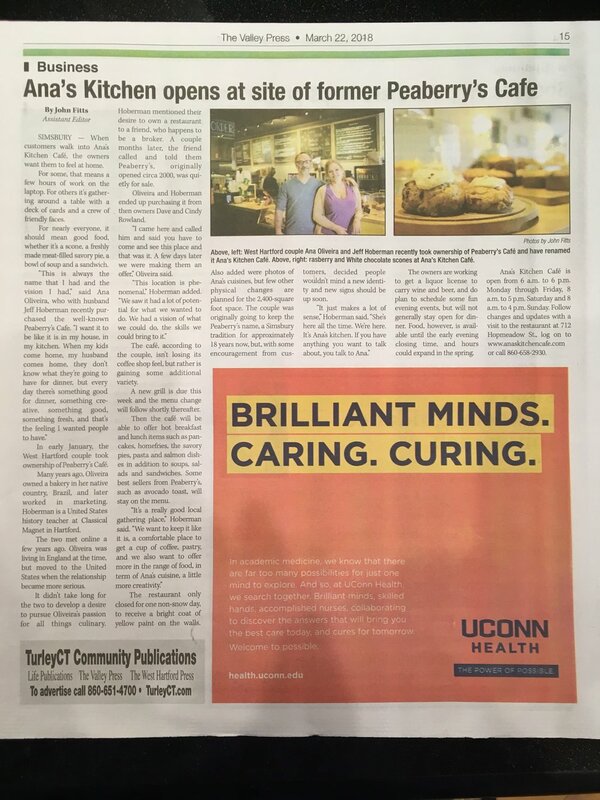 Ana Oliveira and Jeff Hoberman, a married couple that lives in West Hartford, recently purchased Peaberry's Cafe and are transforming it into Ana's Kitchen Cafe. While coffee, pastries and sandwiches remain staple menu items, Oliveira and Hoberman have plans to expand offerings to include hot breakfast and lunch items, and are applying for a liquor permit."